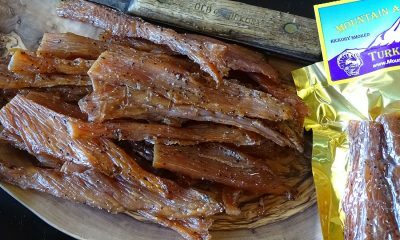 Our Kangaroo Jerky is high in protein, iron, and omega-3 fatty acids. 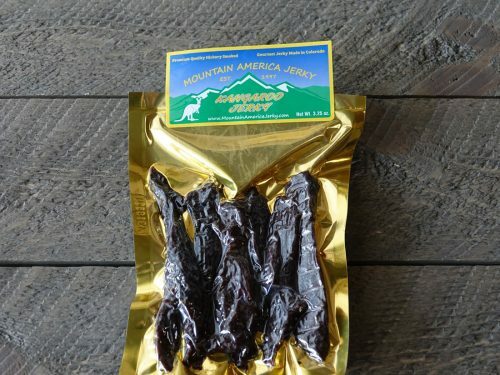 Kangaroo meat jerky is flavored with a simple black pepper marinade for a mild, non-gamey taste. Kangaroo is considered a lean red meat, and it’s really good stuff. Kangaroo jerky is made with 100% solid strips of kangaroo meat…no chopping, forming or grinding here. Never treated with growth hormones or steroids. Preservative-free with no MSG, nitrates, or other fillers. Try our kangaroo jerky and discover a healthy treat that’s easy on the taste buds. I got a couple of packs of exotic jerky for my boyfriend for Christmas. He’s had alligator and boar in the past and liked it… however, he wasn’t a fan of the kangaroo. He had a couple of coworkers try it as well and they didn’t like it either. Everyone’s tastes are different. However, the jerky was more tender than I expected it to be. 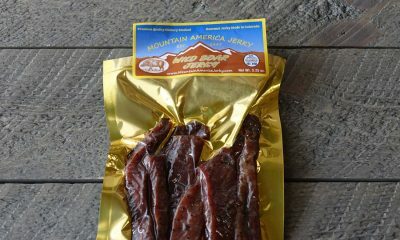 On the bright side, mountain America jerky is a great company. They answered questions very quickly. It arrived in no time at all and they were nice enough to block out the return label (so I could keep it a surprise). 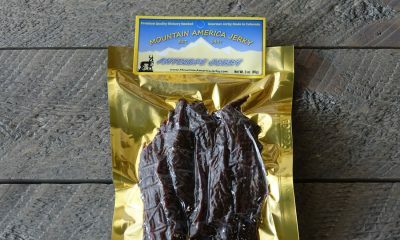 My son has a hobby of trying different kinds of jerky – reindeer in AK, boar in AZ, alien in Barstow, CA (just kidding). So when ordering xmas gifts of rattlesnake and alligator meat for a grandson, I couldn’t resist adding the kangaroo jerky for my son. If only I could attach the pic of his face when he opened it for xmas! He loved it. Bought this for my hubby since he is on an army base and was away for Thanksgiving! Shipping was perfect and he got the package on the day of Thanksgiving! He loved the kangaroo and alligator. Great taste + the company ships to APO. My hubby says the kangaroo is a little gamier than the alligator but still has a great taste to it. Would definitely recommend. I bought this for my husband. first, he was duly impressed with the packaging. Second, loved the jerky. Different and tasty. I also bought the Ostrich, another great taste. Now that I know how good the taste is I will buy more not only for him but for my sons, too. Great product. It was a very unique flavor. I couldn’t even tell that it was kangaroo, that’s how good it was. When I eat exotic meats, there’s so many questions running through my head, the main one being, “Do people really eat this stuff?” I decided that kangaroo would be an interesting choice, so why not? It was delicious! I had no inhibitions that this was made from one of my favorite animals, and I would not hesitate to order it again, it is extraordinary. (Original Kangaroo review) Love their Jerky, will be putting in another order tomorrow!! I got the sampler package and a package of kangaroo jerky! I have been impatiently waiting for this to get here since I placed my order and it just got here 10 minutes ago and OH MY DELICIOUS! I will never get jerky anywhere else, this is the best jerky I have ever had in my entire life and it got here so quick! I’m practically salivating at just the thought of it! If you haven’t tried it yet, I HIGHLY recommend placing an order and you’ll never look at other jerky the same. Hands down the BEST Exotic Jerky on the planet!! 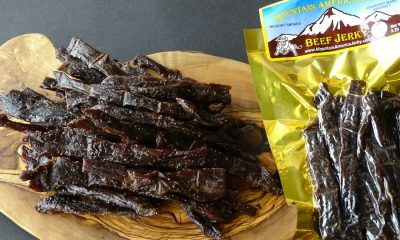 I’ve tried more other brands than I can remember, Mountain America Jerky you won’t forget! Kangaroo: Yes, you read that right. You may have though ostrich and alligator were exotic, but kangaroo is a whole new level of unique (at least in the US). I have never eaten kangaroo in any form. I really had no idea what to expect. In terms of texture, it was much more tender than most of the other meats. It was so tender that I almost wouldn’t classify it as jerky. The recipe is the same as many of the other meats. However, the flavor was more sharp. Though not exactly the same, I almost picked up a salami or pepperoni flavor vibe. I will admit, however, that the thought of eating kangaroo was difficult to get over.